Say goodbye to that dry, scratchy throat you're constantly waking up with. Raise your hand if you're tired of feeling like you wake up in the Sahara Desert each morning. OK, grool. Now let me tell you how to remedy this problem. I live in an apartment where I don't have control over the heating system — meaning, on top of sweating to death, my bedroom is often extremely dry all year long. The solution? This Pure Enrichment MistAire Ultrasonic Cool Mist Humidifier. This quaint water tank has completely changed the vibe of my room and my sleep has never been better! The mist fills the air, keeping my throat and nostrils hydrated and happy for the duration of the night. It has a 1.5-liter water tank, which makes it ideal for bedrooms, offices, and other medium-sized rooms. The humidifier also includes an automatic shutoff feature, so when the water level runs low, it will turn off without a problem. The humidifier uses cool mist, which is said to help you breathe more easily and get a more restful sleep. This version is great for both adults, kids, AND, apparently, cats. Customers love how quiet, sleek, and easy to clean this cool-mist humidifier is, but the main selling point? How effective it is at helping with dry throats and nosebleeds. 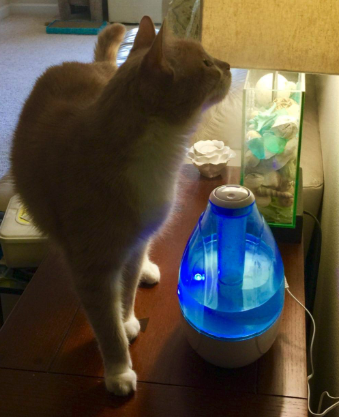 "This humidifier has done wonders for me. I have found that in the wintertime, I tend to have a very dry nose and throat, which causes me to get frequent nosebleeds and wake up with a sore throat. I searched for small humidifiers that I could keep in my apartment's room, to try to lessen the occurrence of these problems. I would recommend this product to someone who has issues during the winter with dry nose, throat, skin, and lips. This product works great! I have found that I only need to refill the water supply once a week. This humidifier is quiet and doesn't make any noise or emit any light, which I personally enjoy. 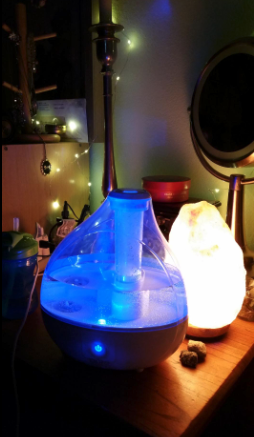 So far, this humidifier has helped me wake up feeling well refreshed and ready to start the day. I have noticed that since buying this humidifier, I have, in fact, reduced the amount of nose bleeds and sore throats I get. It also comes with an AC power adapter, a disk cleaning brush, user manual, and a two-year warranty — all for $40! What are you waiting for? Get this humidifier from Amazon for $39.99 and start sleeping peacefully through the night!